Friday FAQs: Potluck options, Raw Chocolate Brownie swaps, fun lunch ideas, and more! It’s hard to believe we’re on the cusp of another long weekend here in Canada! Is it really August 1st on Monday!? We’re looking forward to celebrating our friends’ wedding tomorrow, and getting together with some neighbours and their kiddos for a pool day on Sunday. Oh, and a 3-day reprieve from all this renovation noise, hah. Should be a good one! I hope you enjoy yours, too. Q1. Hi Angela, I’ve got a potluck SOS! On the August long weekend we have a big horseshoes competition at my cottage, and this year I’m stumped for what to bring to the dinner afterward. It’s my first year going as a vegan, and I want to bring something I can eat but that everyone else will enjoy, too. Do you have any ideas? I thought about your Crowd-Pleasing Vegan Caesar Salad, but then I remembered at least three different people always bring Caesar salads!! A. Hey Cassie, Sounds like you have a fun weekend in store! For a hearty entrée-type dish, my Crowd-Pleasing Tex-Mex Casserole (The Oh She Glows Cookbook p. 149) is bound to be a hit at your potluck—its name’s well earned! You could also try my Next Level Vegan Enchiladas or Life-Affirming Warm Nacho Dip (p. 83) served with tortilla chips. For all three, I would try assembling beforehand, storing it in a cooler, and cooking it just prior to serving. For a quick, low-fuss appetizer, you could make some homemade hummus (like my Classic Hummus in The Oh She Glows Cookbook p. 89) and pair it with a platter of homemade or store-bought pitas, breads, and/or crackers (my Endurance Crackers are great served with hummus!). A couple solid alternatives to the Caesar salad standby include my Best Shredded Kale Salad and Tangy Cilantro-Lime Quinoa Salad. For both of those salads, I would wait to mix in the dressing until shortly before serving so it stays fresh and flavourful. And dessert-wise, it’s hard to go wrong with portable, easy-to-serve Almond Butter Rice Crisp Treats. I have yet to meet someone who doesn’t love those. I hope these ideas get the wheels turning, Cassie—have a happy and safe long weekend! Q2. Your Two-Layer Raw Chocolate Brownies look amazing! I love the idea of double chocolate. Is there a substitution for walnuts? A. Hi Katie, The walnuts lend a nice “brownie” flavour, but you can absolutely substitute them if need be! Pecans are probably the most popular swap, but I’d think almonds would work well, too. Almonds are a bit drier than walnuts or pecans so you might need to add a touch of water when processing to help it hold together. Be sure to let us know what you come up with! Q3. Hi. 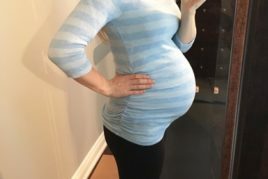 I am trying to eat healthy but watch calories/fat after having baby #4. Do you post nutritional information anywhere? Also I would like to refer patients to you but many are diabetic and also watching weight, so they need to keep track of macros. Q4. I love these vegan lunch ideas, but I have one problem: my partner and I work from home, and he will not eat another sandwich, soup or salad, he was mostly raised on those, so not sure what to do for lunches anymore. Anyone have ideas? He cannot have lentils or beans of any kind, thanks. A. Hi Jerry, Oh, that’s a tough one! I find the benefit of working at home, though, is that you have full access to your kitchen, so that should help expand your options a bit more. My Broccoli & Cashew Cheese-Quinoa Burritos (The Oh She Glows Cookbook p. 159) are a tasty possibility; the filling could be prepared beforehand, stored in the fridge in an airtight container, and reheated then placed in a tortilla wrap when you’re ready to have it for lunch. Sometimes just switching up the traditional sandwich into a wrap makes things so much more exciting! You could also do the same with my other burrito fillings (try my newest DIY Burrito Bowl or my Black Bean and Butternut Squash Burritos from back in 2011!). If he can’t have beans, you could simply leave them out or swap them for more veggies, tofu, or quinoa. Again, you can prepare the filling in advance and simply reheat the leftovers and wrap it up for lunch. Easy and so tasty! The filling often tastes even better the next day, too. If you’re open to a “second breakfast”–type meal, I’d recommend my Sunrise Scramble with Roasted Home Fries & Avocado Toast (p. 33). 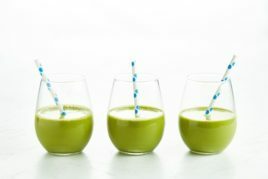 Or, if you’re really on board with second breakfast, there’s nothing wrong with going for a hearty smoothie bowl (like my Green Tea Lime Pie Smoothie Bowl), overnight oats, or a meal-sized protein smoothie. Sometimes when it’s really hot out I make a huge meal-sized smoothie that’s packed with hemp, chia, protein powder, veggies, fruit, and more. You could also whip up my Life-Affirming Warm Nacho Dip (p. 83). Stored in an airtight container, it can be kept in the fridge for 3 to 5 days and easily reheated in the oven, so you can make a batch one evening and let it feed you for at least a couple lunchtimes (depending on how quickly you gobble it down! It never seems to last very long in our house…). That’s too funny, Mindy—you know your go-to recipe is a hit when people start borrowing it! Thanks for leaving the awesome comment, sharing those modifications with us, and spreading the Oh She Glows love. I’m so happy you enjoy the cookbook so much, too! Theresa, I can so relate to “preparing breakfast while holding” your kiddo! My 22-month-old still loves to be picked up so she can watch me cook. ;) (Who knew food prep could be a workout too?!) But yes, prepping breakfast in advance is so key, and I’m so glad you’re enjoying the parfaits! It’s a nice change from the typical smoothie or bowl of oats. 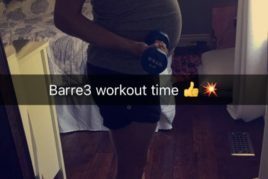 Congrats on your little one, by the way! I’m so excited to have a newborn in my arms again soon. :) Soak him up. 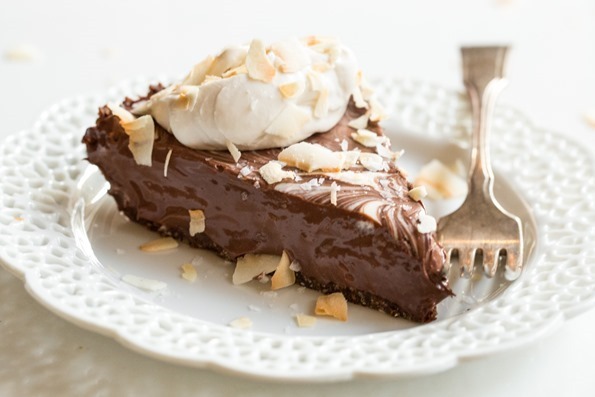 PS – That little slice of deliciousness at the top of the post is my Double Dark Chocolate Macaroon Tart. Never a bad idea. Summer Glow Buddha Bowl + News! Re: your potluck question. I now bring the nacho dip everywhere and everyone loves it! I like to get everyone eating it and then telling them its vegan and to guess the ingredients. Stumps and then surprises people! Oh yes. I’ve had fun with that one too!! Everyone loves it! Hi Angela, just wondered if you had a recipe for the chocolate dish featured at the top of the post – looks to die for!! I’d add that I’ve also been stumped what to bring to potlucks. I’ve had success with the following which can all be made vegan: Spanish rice, Mac and cheese, lentil/bean and rice casseroles. The vegan Mac and cheese, I’ve made more than one of Angela’s variations, if you can handle a hot dish, has always been BIG hits. I think we tend to over think vegan options for groups. If it tastes good, most people won’t think twice!! Thanks so much for the great suggestions! My 28-month-old loves to be at the counter and would prefer to be held… We got one of these and it has really saved my back! Plus, she is so happy to be up where she can see and participate! That’s so cute! I think she would love that, heh. Do you have suggestions for portable food for a 30+ hour relay? It’s a 130 mile walking relay with 12 walkers, 6 in each van. Because of the race, we all eat at different times, and we typically have to eat while driving so handheld food works best. Based on last year’s race, we had too much bread and sweets and not enough savory and protein. Of the 6 of us, I’m vegetarian, and another is gluten free and allergic to eggs, so I think your GF recipes will be perfect for the whole van. We’ll have a cooler but with limited space and stops, the noncooler foods tend to get eaten more. Thanks for any suggestions! I too, have been making variations of The Best Shredded Kale Salad Ever since it came out. My husband and I have both taken it to potlucks at work and it’s always a bit hit! I’ve shared the recipe countless times. Tucson Arizona loves your kale salad! I just read the comment about nutritional information and when I read that it will be included in the next book I did a stage whisper shout “YESSSS!” at my desk! I’m paying attention to the nutritional info on what I eat because of a weight-lifting plan, and I just love love your cookbook but haven’t used it as much recently because I haven’t taken the time to calculate nutrition facts for the recipes. I was already excited about the launch of book 2, but now even more so!!! Would also love if you find someone to calculate for existing recipes like you mention in this post! THANKS!!! That’s so great to hear, Michelle! Thanks for the suggestion. I seriously love all of your desserts. I am lactose intolerant and have a slight fructose malabsorption problem so finding natural, vegan desserts for me is key! It is a fantastic recipe. I cannot wait to try out your deserts, especially the one pictured here. I have been experimenting with vegan baking and it is so much fun! My daughter is three now (meh! Growing too fast! )…I still hold her or bring up a chair so she can help me cook. She likes to take the garlic skin off and be the “stirring fairy”? Haha love sharing a hobby we love together….cooking and now, hopefully, baking too! 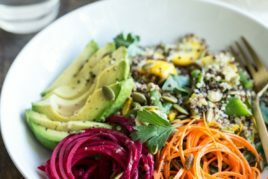 Previous post: Summer Glow Buddha Bowl + News! Next post: My Bonus Recipe Bundle is here!